On Saturday June 22nd GAMRU, unit 240 christened their new rescue boat. 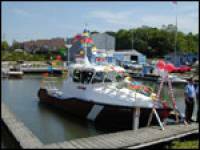 The vessel is 34 1/2 ft steel with an 11 ft beam and is powered by 2x 317hp diesel engines. The vessel is fully equipped including radar,chartplotter / GPS, 2 vhf radios SAR and first aid equipment. The vessel is crewed by 3-5 crew members. The members of GAMRU raised the money over many years to build the vessel. The members themselves spending many hours laboring to help build the hull and outfit the vessel. The Trillium Foundation provided the needed funds to complete the project.